In Italy, there is very low penetration and awareness of online laundries. The task was to create awareness and engage the target by stressing the two main benefits of this essential service: speed and simplicity. They indentified a niche target among young managers and professionals. These busy inviduals work long hours and have difficulty finding an open shop when they leave their office. They mailed 1000 targeted DM's. The shipping box becomes a T-shirt shaped target and the recipients have been invited to hit it with a squishy tomato: the game showed the speed and the effectiveness of the service. 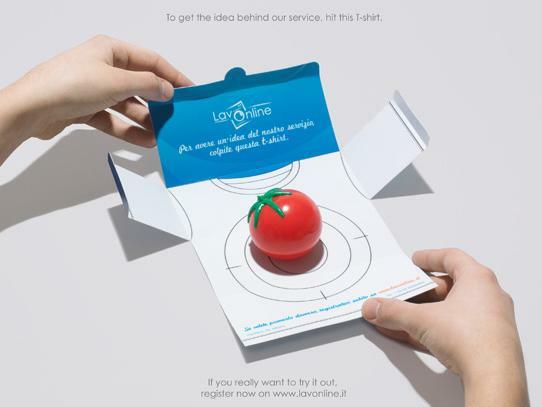 Results: Within 4 weeks 32% of their recipients registered on the site lavonline.it. The overall site traffic increased by 15%.